I remember seeing a series of photos of people in what should have been some of the most important moments of their lives (like wedding days, holding new babies, etc.). Instead, they were all on their phones. Not enjoying the moment, not talking to each other, but looking at phones. From a less dramatic perspective, I’ve also been guilty of looking at my phone during moments that should be some of the most important in my own life: meals with my family, time with my children, time with my husband. This inspired me to share something I’ve been doing for a while that has really helped bring some balance to my life: a weekly digital day off from all technology. Digital Day Off? But Why? I get it… technology is an incredible thing. We live in a world with more information available at our fingertips than was available to all of human civilization not long ago. In fact, Google CEO Eric Schmidt has been quoted as saying that every two days, we collectively create as much information as has been created from the dawn of civilization until 2003. This is an incredible benefit from the perspective of societal advancement, but it can also be a curse. While our social circles were once limited to a small group of people who were geographically close to us, we now have the ability to connect with friends and family around the world, at all times. We have constant news about new babies just born to our friends, what a family member ate for dinner, or the ever-mysterious status updates that leave us wondering about the emotional state of someone we love. In just one generation, we’ve adapted to taking in an enormous digital diet every day. How it affects us is a big question mark and of the one reasons I chose to make digital detox one of the steps in my book The Wellness Mama 5-Step Lifestyle Detox. We digitally “connect” much more, but according to many sources we are actually connecting on a human level much less. Aside from the fact that I don’t want my children to remember me as always checking my phone, new research is showing that our constant use of electronics is actually changing us, mentally and physically. Results from the few studies that have been done are troubling. Social media appears to promote narcissism, smartphones could be causing insomnia, and screens seem to be making our kids less empathetic. Neuroimaging of frequent Internet users shows twice as much activity in the short term memory as sporadic users during online tasks. Basically, our brain is learning to disregard information found online, and this connection becomes stronger every time we experience it. So the more we use Google, the less likely we are to retain what we see. All this to say that technology is quite literally changing our brains. In fact, the book Mind Change argues that technology poses a threat to the very way our brains work and adapt. The author cites studies that show that technology use, especially in children, creates dopamine responses similar to drugs or junk food, shortens attention span, reduces empathy and creates many other problems. As a mom, this is especially concerning, as my children are still developing these and many other capabilities and it makes me wonder about the long-term affects on their entire generation. This is one of the reasons my husband and I have been pretty careful to limit our children’s tech exposure, especially at young ages, and part of the reason that Steve Jobs didn’t let his children use iPads. What about changes to the body? Aside from the mental aspects, constant exposure to technology may be actually physically changing us as well. Many phones, TVs and computers emit blue light, which we now understand can affect our normal circadian rhythms and reduce proper sleep hormone production. This is why our children don’t have nightlights and we limit their exposure to blue light devices after dark. It is also why I wear orange sunglasses and run programs like f.lux when using my computer after dark. Other research suggests that technology use may be changing our posture, contributing to obesity and sleep problems, and leading to other problems as well. Again, technology isn’t bad, but our overuse of it might be. The good news is that it appears that even short breaks from technology can have a positive effect. In 2015, researchers took a group of 35 people that used the internet often (CEOs and entrepreneurs) into the desert in Morocco to study if their behavior would change with and without technology use. After only a couple of days without their smartphones, researchers saw these people exhibit better memory, relationships, conversation, and changes in perspective. From a physical perspective, they also saw better posture, sleep and memory. All from just three days total! Especially considering the attachment that younger generations have toward technology (and that many adults have as well), I’m finding that balance and an occasional digital day off are helpful for our family. Technology is a tremendous asset in so many ways, but rather than letting it control our family, I’ve been putting measures in place so that we are in control. Despite the fact that my blog and many aspects of my work are online, I’ve noticed that my digital day off has had only a positive effect on my life and my work/life balance. As I mentioned, we already severely limit screen time for our children, but I’ve recently started implementing limits for myself too. As a blogger, it is all too easy to check Instagram while eating dinner or listen to a podcast while cleaning the house with my kids, but my family deserves better than that. I decided to implement for myself 2 days a week that are a “digital detox” or digital day off. From the studies I saw, even just a couple of days away from digital technology were enough to create better memory, increase creativity and improve sleep. During these days, I won’t use my computer or phone with the exception of phone calls to or from family members or friends. The first couple of times I did this, I found that I was antsy and kept having the impulse to check my phone. I made an effort to instead read or play a game with my kids, or pick up a new book. Now, I savor my time away from my phone and computer and look forward to them. Currently, my digital day off is officially on Friday (which is now our designated field trip day) and one other day of the week depending on schedule. I also won’t check or answer my phone during family time, school time, or meals, or while spending time with someone in person. I’ve greatly enjoyed my digital time off, but more importantly, I want to make sure that my children see an example of uninterrupted family time and balance in daily life, as these become elusive in a fast-paced, high-tech world. From a blogging perspective, this time off has increased my creativity and made me much more productive. Don’t always use the camera on your phone– For me, the biggest temptation of using my phone is often to take pictures to document something my children are doing. As quickly as they are growing and changing at their ages, I sometimes wish I could hold each moment in a time capsule and pictures seem the closest I can get to doing this. The thing I realized is that while I have many memories stored on my phone, I hardly ever look at them except when I make our yearly photo books. Rather than turn to the phone, I’m trying to get better at soaking up memories vividly in my mind so I’ll always have them to look back on, with or without my phone. Make a conscious effort to fill the time in a meaningful way– Just turning off the tech won’t do much if you spend the time stressed or putting out rhetorical fires. Make a plan for phone and computer free time so that you can get the most out of it. Go on a retreat sans phone or computer– I’m able to do this more as my children get older. The benefits are obvious, but getting away without any technology use is what the study showed had the most rapid effect. Taking even just 2-3 days away, preferably in nature and with other people, is a great way to undo some digital damage. Tell important people– To reduce stress, I let people that might need to text or email me for information know about my digital day off so that they won’t get worried or think I am ignoring them. These select people also have the ability to call me in emergencies, and I’m usually spending the day with most of them anyway. Schedule it each night– Since blue light can be most disruptive to sleep patterns, consider starting digital time off each night. Whenever possible, I love to put down the phone and computer when I start preparing dinner for our family and not pick it up until the next morning. Not perfect at this by any means, but working on it. Once or twice a day only– My goal is to only check email, social media, etc. once a day. I’m still working on putting systems in place so that I can accomplish this, but this is my ultimate plan. Inspired by a friend, I’m working on creating auto responders for my emails that alert people that I have received their emails but only check once a day at a certain time. Balance is always a moving target and obviously the “right” answer here varies and depends on multiple factors. Each family has a unique set of factors to take into account. This is what has worked well for me, and I’m sure it will change over the years as technology changes (at warp speed) and as my kids get older. Still, it’s worth the effort to figure out the best ways to use technology in our homes… rather than letting it use us. How do you balance the benefits and drawbacks of technology? 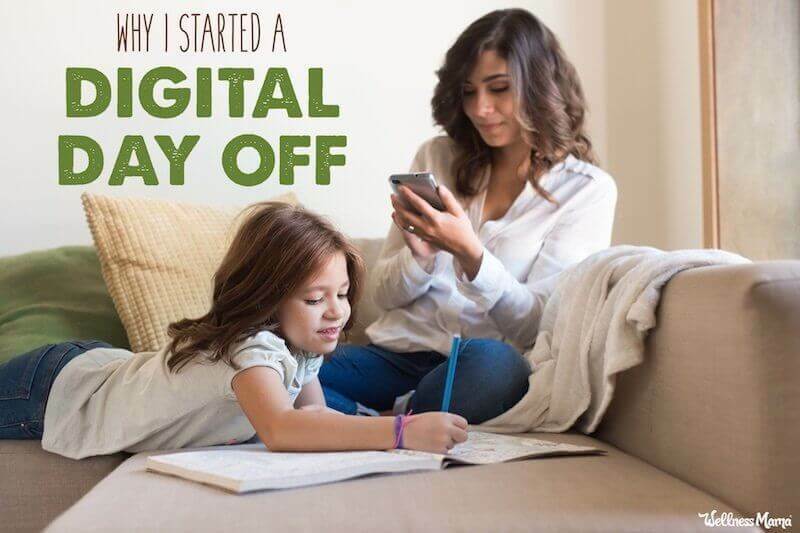 Do you have a digital day off?